My sister has a white Lhasa Apso. Ever since he was a puppy his hair on his lower back is discolored. The color of his lower back is brownish pink. He is always biting at it. 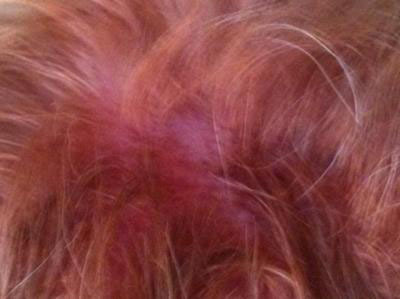 I was disturbed when I pulled back his discolored hair to see that his skin is red, raw and scabby. Long story short- I'm pissed at my sister for buying a dog that she cannot afford to take to the vet when his health is in question. Her dog is 2 years old now with the same skin issue that I had saw on his back when she first got him as a puppy and she still hasn't taken him to the vet. I'm only in town for one day, and I don't have a lot of money but I was wondering if anyone could recommend something I could do for this dog today: over the counter ointment, a dip bath, home remedy? I'm willing to send my sister money from my next check to take him to the vet, but until that time comes I would like to get him some kind of over the counter ointment to soothe the itching so he isn't miserable. I only have a iphone camera, which isn't great quality but I will attach a few pictures of his discolored skin in hopes that it will help in the recommending. Thank you for taking an interest in your sister’s dog’s well-being. The discoloration that you describe and that the pictures show is a result and not a cause of the itching. Pigment present in dog saliva turns that reddish color when it is exposed to air so it is just another sign that the dog is licking and chewing at his hind end. The location of the itchiness might give us a clue to its cause. The area right in front of the tail is a favorite place for fleas to hang out and bite. Even if you don’t see a flea on the dog, you can’t rule the nasty little buggers out as a cause. Dogs with flea allergies are driven absolutely crazy by just a bite or two. If you are looking to do something to help, purchasing a six month supply of a good flea preventative like Frontline is probably your best option. 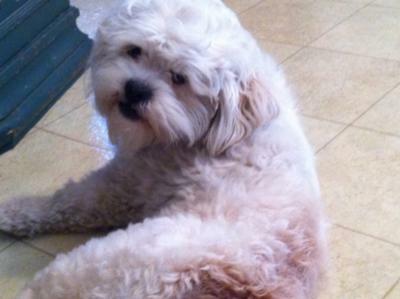 Occasional baths, dips or sprays won’t do the trick if this Lhasa is flea allergic. If I’m wrong about fleas being the cause, at least the Frontline won’t do any harm.